There has been More than 500000 happy customers from TheCelebrityDresses since 2008.See what some TheCelebrityDresses's satisfied customers have to share about their prom and wedding dresses and the service they received from TheCelebrityDresses’s customer service team ever.Here you also can find the glowing praise and experiences from worldwide customers.Everybody has a a story with her dress. What will your story be? Beautiful piece, perfectly tailored. Shipping was in the expected time! I received my dress earlier than expected and am very very happy with it! This dress is so amazing! Get tons of compliments at my senior prom. Nice dress! The fabric was wonderful, very high quality.Recommend buy it. The dress is well made and more beautiful than expected!Love this site! Absolutely stoked with the dress !The velvet felt very high quality and luxurious. Loved my dress so much!The quality was surprisingly great! Definitely recommend this dress! Will be buying off here again for sure! BEAUTIFUL!I loved it that much I had to share it with you. So stunning!Thank you to TheCelebrityDresses for my dress. 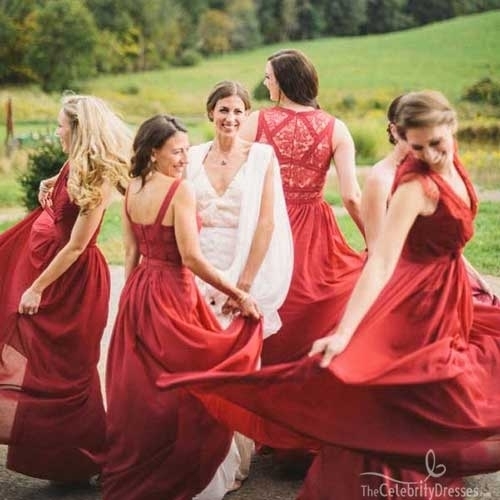 More and more customers from worldwide choose TheCelebrityDresses to make their wedding and bridesmaid dresses as they believe that we can bring a lot of compliments and happy for their wedding.Are you ready to design your bridesmaid dresses for your wedding and share the beautiful photos?